Pros: Small, convenient to transport. I loved that it came with Microsoft Office so I could use it for school. I also liked the touchscreen. Cons: I have had it for 1 year and 2 months and it has completely died. When I turn it on it only shows the startup Brand name and but won't even load the login screen. I have tried several times to get it to turn on (since there is no battery to take out you have to wait for it to die each time) with no luck. While it worked it was only ok, it would sometimes randomly take me to other pages and screens without clicking on anything. Other Thoughts: I would not recommend this product to my friends, nor would I ever buy it again even if I found it for a great deal. Pros: Good compromise between tablet and laptop. Keyboard is useful if a little tight. Display is good quality. Batter life seems good. Cons: Twice the unit has tried to load Windows automatic updates and hung. Both times I had to Reset to factory default losing all data and programs I had downloaded. I turned off automatic update. Other Thoughts: I'm hoping the Windows update issue will get resolved. Other Thoughts: I wanted to love this tablet a lot, especially given its portability, size, and price point. However, given the issues that it does have, I simply can't recommend this to anyone else at all, at least not until Asus gives out a comprehensive update that fixes these issues and/or gives a full, comprehensive guide as to how to fix these issues. Thank you for the positive comment. I'm sorry if you cannot use the keyboard to wake up the system. To successfully wake it up, you need to double press or click the touchpad. Also, please verify if the unit is running with the most current BIOS version. I do understand your concern regarding the issue with the WIFI device. Please verify if the onboard WIFI device is within range to an established wireless router or access point and internet service is working properly. Also, please verify if the unit is running with the most current system update. Should you need further technical assistance, please email me at cl-rodel@asus.com and write down service# N141141255 on the subject line. Pros: Able to run anything a full blown laptop can run with 95% of the convenience of a tablet. Super light weight, and easy to tote around. Cons: Keyboard is a little small. Pros: *Light and durable when closed...I just throw it in the backpack as is and head out with it. *would be nice if the USB port was on the tablet itself. Other Thoughts: I installed VLC media player and Letasoft Sound Booster to compensate for the extremely low speaker sound. I also place an open book behind the tablet to increase acoustics while playing movies. Once the trial for Letasoft runs out I will either pay for it or go back to not being able to hear very well. If you really just need a windows tablet so you can run Office on the go...this is a great choice for the price. 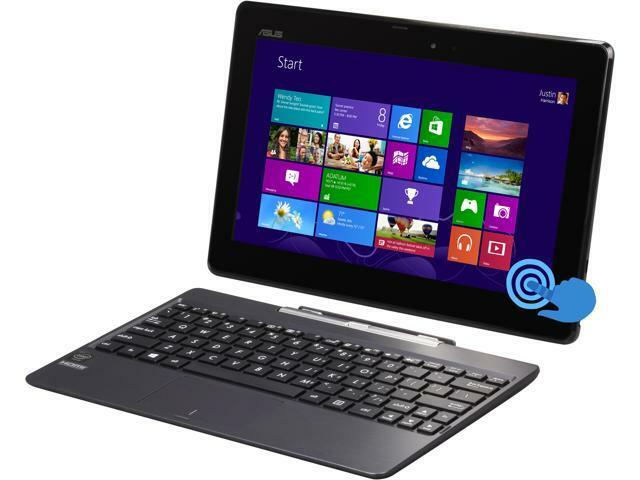 Great value for the price...don't be a snob...realize this is an entry level windows tablet.